Workshops can be so inspiring! Next Week, I’m attending the Cape Cod Writers Center Conference in Hyannia, and in November, CrimeBake in Dedham, MA. Looking forward to the seminars, workshops, and meet-the-agents in both! CrimeBake sounds like a blast–although it might be dangerous with all those creative minds cooking up crimes. I tend to write such short pieces that I can hold the entire plot in my head at once. Now that I’m trying my hand at some longer projects, I think I’ll be having some adventures with a plot outline. I find it very satisfying to marry my creative brain with my analytical brain. Poetic investigation meets plot points. Gotta love it. I never thought of it like that. It is indeed merging the creative with the analytical. Good luck plotting the plot in your project! I initially mapped out my plot in a set of acts with an overall arc that resembles the chart you shared, but the process of point A to point B without giant improbable gaps seems to develop as I work on my outline. 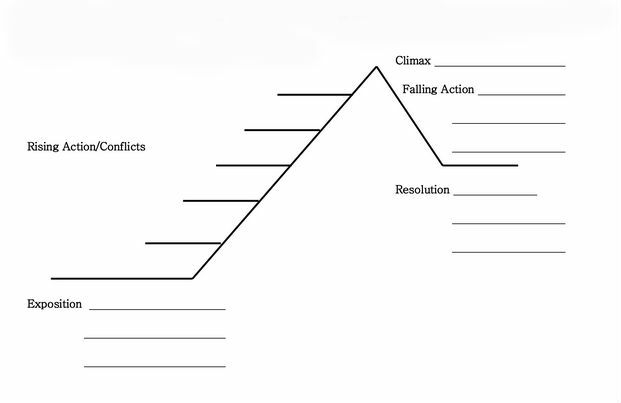 Having a general idea of the structure and general arc is helpful, but I am finding the real payoff in the outline. It serves both to spur me on and and give me tangible targets at which to aim. I agree, since I posted this I’ve worked on the plot outline and had the same result. Outlining has proven a huge help in developing the story. That was the drawback, Shaeffer Hall was offering heat stroke and frostbite in July, on an alternating basis. Good for you for nailing down your plot! Sounds like you really benefited from the experience. I’ve wanted to attend workshops and conferences but haven’t been able to make it work within my challenging budget. So, I signed up to take a writing class at the local Adult School. Hoping I’ll get something from it. I’m suffering from similar budget challenges myself these days. Hope you enjoy your writing class!